The Algerian president Abdelaziz Bouteflika vanished from the country’s political scene for two months. He was reported to have suffered a mild stroke. He reappeared in a French hospital and subsequently returned to Algiers for a period of recovery. Algerians are looking to the future. Over a two-month period Algerian president Abdelaziz Bouteflika vanished from the country’s political scene. He was reported to have suffered a mild stroke and travelled to France in order to receive medical care. His absence sparked rumors that the 76-year-old president had either passed way or was in a coma. There were widespread calls among opposition parties that Article 88 of the constitution should be invoked. However on June 12, 2013 news footage appeared showing Bouteflika in the French hospital of Val-de-Grace discussing plans for the next cabinet meeting with Prime Minister Abdelmalek Sellal and Chief of Staff Ahmed Gaid Salah. On July 16, the president returned home to Algeria and it is reported that he will enjoy a “period of rest and recovery”. There is relief from many quarters that a power vacuum has been averted until next year’s presidential elections in April. The consensus is that Bouteflika will not run for a fourth term, even though he introduced an amendment in 2008 removing limits on presidential terms. For the moment there are no likely successors, but possible candidates include Prime Minister Sellal, former Prime Minister Ahmed Ouyahia and even former President Liamine Zeroual. Next year’s candidates will have to gain the backing of Algeria’s military and intelligence elite le pouvoir and undoubtedly they will need the support of Mohamed “Tewfiq” Mediene, the director of Algeria’s intelligence service the DRS. Mediene is considered to be one of the most powerful men in Algeria and it is often said that the DRS truly holds the reins of power in the country. 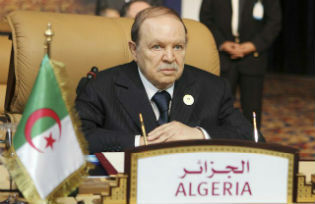 This year Algeria has needed the aid of a decisive leadership, since it has been marred by a number of crises. On January 16, militants from the al-Qaeda splinter group Al Mulathameen or the Signed-In-Blood Battalion, led by the Algerian-born Mokhtar Belmokhtar attacked the remote gas plant of Tiguentourine near the municipality of In Amenas. The facility is a joint operation controlled by Algeria’s national oil company Sonatrach, BP and Statoil. It produces two percent of Europe’s gas imports. On the day of the attack, militants dressed in military uniforms singled out foreign nationals and some were forced to wear explosives around their necks. A day later, Algerian Special Forces, under the direction of the head of the Directorate for Internal Security, General Athman ‘Bachir’ Tartag, launched an offensive to remove the militants. At the end of a four-day siege, at least 38 workers and 29 militants had been killed. The incident raised major concerns regarding the safety of all foreign workers at the country’s gas and oil facilities. Many foreign companies removed non-essential staff and many expressed anger at the ease with which militants were able to penetrate the “ring of steel” surrounding the site, which included a large number of Algerian security forces, armed with attack helicopters and Soviet-built T-72 tanks. In the aftermath, there were questions over whether or not projects would be put on hold. The Tiguentourine plant suffered damage to two of its gas purification plants and while there was a loss in production, Algeria’s energy minister told the press that they would compensate by using other fields. Yet BP’s chief executive Bob Dudley said that some projects would have to be pushed back, which forced Britain’s ambassador to Algeria to offer reassurances that BP was committed to remain in the country. Norway’s Statoil has said it will double its security staff in its international division. On July 7, Algeria was nevertheless given a boost with the announcement that it was signing an agreement on an energy partnership with the European Union. The head of the Commission Jose Manuel Barroso announced: “energy is a priority sector for the Euro-Mediterranean partnership, because it is vital in order to build a shared zone of prosperity and stability”. Algeria is facing a tide of problems from beyond its borders and given that 98 percent of Algeria’s export earnings come from oil and gas, it is critical that Algeria’s government works to eliminate the threat of similar attacks in the future. Due to France’s intervention in northern Mali in January, there has been a considerable movement of militant activity towards southern Libya and also into the area of Jebel Chambi on the Algerian-Tunisian border. The Tunisian military has been working to crack down on al-Qaeda operatives in this region. Given the nature of this threat, both countries have formed a military-security liaison and coordination committee to share information on terrorist activities. Since May at least 6000 Algerian troops have been posted along the border with Tunisia. On June 10, Algerian Foreign Minister Mourad Medelci said, “the borders with Tunisia and Libya are well secured, thanks to co-ordination with the two countries’ governments”. During this year’s holy month of Ramadan, Algerian security forces have been on high alert due to fears of terrorist attacks. Security has been stepped up at mosques, public venues and at the country’s beaches. This year Algeria’s Ministry of Defence has asked for a budget of $10.3 billion in order to face growing security challenges. The elusive militant Mokhtar Belmokhtar, who French intelligence call the “uncatchable” was thought to have been killed by Chadian forces in Mali, but it turned out not to be true. On May 23 he directed a suicide attack against a military base and a uranium mine in Niger, which killed 25 people. Algerian anti-terror forces have spent over five years trying to persuade Belmokhtar to surrender, but to no avail. The Algerian government’s determination to lend its support to its neighbors, such as Mali and Niger has also raised the likelihood that al-Qaeda and its offshoots will continue to target Algeria through its porous southern borders. The country is already embroiled in a serious hostage crisis, which began in April 2012 when seven Algerian diplomats were captured in the northern Malian town of Gao by members of the radical Islamist group, the Movement for Oneness and Jihad in West Africa (MUJAO). So far three have been released, but MUJAO claims that one diplomat was executed in September, but this has not been confirmed. The group demands a ransom equivalent to $19 million and for Algeria to release its members currently in detention. However the Algerian authorities have been explicit in their opposition towards paying terrorists ransom money. It welcomed a recent declaration by G8 leaders to refuse payments to terrorist groups. A Foreign Ministry spokesman said that Algeria would continue to “work actively” on this issue with its British and American partners. In the wake of January’s attack Algeria has been under pressure to maintain and attract foreign investment into the country. Foreign companies are limited to a maximum 49 percent stake in investments, as they are obliged to have a local partner. Algeria’s national oil and gas company Sonatrach is given majority ownership of projects. Often foreign companies are reluctant to invest due to past allegations of corruption within the company, as well as a lack of fiscal incentives offered by the government. This is particularly noticeable during licensing rounds. To try and win back foreign investors, in January Algeria’s parliament agreed to a series of amendments to the country’s hydrocarbon law. Nevertheless, Algeria has gained a reputation as a difficult country in which to do business. In 2013 the Heritage Foundation index of Economic Freedom ranked Algeria 145 in the world, putting it below Laos. Nevertheless, the government has been working to allay fears by announcing it is taking tougher measures against corruption. Nouredine Bouterfa, the chief executive of the state’s gas and electricity company Sonelgaz and fifteen other executives are under investigation over the awarding of contracts to General Electric and the French power generation company Alstom. The Italian oil and gas contractor Saipem has been in trouble with the Algerian and Italian authorities for allegedly paying bribes to Algerian officials to win contracts. Saipem is a subsidiary of the Italian oil giant ENI and both are accused of allegedly paying over $255 million to secure a $14 billion deal with Sonatrach. On June 20, it was reported that according to Energy Minister Youcef Yousfi any foreign company convicted of corruption would be blacklisted from working in the country and may be asked to pay reparations. Algeria’s relations with GCC members are giving it reasons to be optimistic. For instance, trade between Algeria and the UAE has been growing at 60 percent annually from 2005. UAE’s state investment agency Mubadala launched a power plant in the Berber-speaking town of Tipaza in 2009, adding 20 percent to the country’s energy supply. Algeria and Qatar have also signed a number of partnership agreements covering areas such as industry, mining, oil and gas. The former Emir of Qatar visited Algeria in January and both countries agreed to the construction of a steel plant, which will have a production capacity of 10 million tonnes of steel per year. Saudi-Algerian relations have also been improving. In November, Algerian diplomats celebrated the country’s national day with Saudi officials in Jeddah and Saudi investors have also shown interest in purchasing Algerian farmland. On June 19, the 6th Algerian-Omani Joint Committee was opened and Algeria’s foreign minister said the meeting would “help enhance our economic cooperation and open promising prospects for greater coordination and complementarity and for strengthening brotherly ties and cooperation”. Even though Algeria has foreign reserves worth $200 billion, the country is still suffering under the burden of social inequality. Although the IMF has indicated that unemployment is expected to fall to 9.3 percent in 2013, many consider this number to be skewed in light of realities on the ground. Algeria has seen a spate of protests over unemployment. Earlier this year, there were clashes in the southern town of Ouargla, over unemployment and the lack of housing. Youth unemployment is far greater than the national average and many young men or harragas, meaning “those who burn” try year after year to cross the Mediterranean illegally looking for a better life in Europe. After the start of the Arab Spring, the Algerian government agreed to lift the state of emergency, offer generous social handouts, low interest loans and cheap housing. Algeria’s banks have announced they will finance a $15 billion housing project to complete 250,000 homes by the end of next year. However the Algerian government has committed itself to two major housing construction programmes to construct 1.2 million and 2 million homes since 2005, but both have fallen short of their targets. Nevertheless the government is aware that as soon as tensions start to rise, it can use its resources to placate the population. Recently, an Algerian medical student told foreign journalists: “There is oil here, and every time the people aren’t happy the government gives them money”. President Bouteflika will probably stick to this policy until the end of his term in office, and will not play an active role in public, which has been the case since his re-election in 2009. If we are to see a dramatic shift in Algeria’s domestic policies, then we will most likely have to wait for his successor. Given that Algeria’s neighbors are currently in the midst of enormous political and social upheaval, it is probable that Algerians will want a managed transition, especially in light of the country’s brutal civil war. Even so, the departure of Bouteflika from politics will mark a new age for Algerian history, as he is one of the last remaining leaders from its time of independence.